Salomon has arrived. Fall 2014 models. After giving the Salomon Speedcross 2 high marks way back in 2010, I was looking forward to trying out the follow-up version, the Salomon Speedcross 3 ($125). Hoping that my favorite aspects of the shoe would remain the same, I was happy to see that Salomon made tweaks in all of the right places. When I first put on the Speedcross 3 I noticed that the toe box felt just a bit roomier, which was a nice change over the somewhat narrow Speedcross 2. The Speedcross 3 retains the 2′s snug fit with great midfoot and heel lockdown, but my toes had just a bit more wiggle room. Salomon kept the same ripstop nylon upper, which in my opinion, is the most durable trail shoe upper I’ve ever worn. The weave of the nylon is especially effective at keeping dirt and debris out of the shoe and cholla cacti, my sworn enemy, at bay. The Speedcross 3 also does great at keeping your feet warm in cold, wet, and snowy conditions as the dense weave really seems to lock heat in. Conversely, I struggled with the Speedcross 3 in very warm conditions above 80 degrees and the upper drains more slowly than a shoe with a more open mesh. Drainage problems seem to be exacerbated by the Ortholite footbed that, while adding cushioning, seems to soak up water pretty well. The reinforced toe area acted as an effective toe bumper when I nearly took some headers and saved me from some blackened toenails. The overlays were basically kept in the same places on this update with all overlays being incorporated into Salomon’s Quicklace system. However, the overlays on the Speedcross 3 are completely welded on and seamless which decreases the weight of the upper and makes the upper more flexible. Salomon enlarged the lace pocket which helps tuck a little bit more of the excess lace out of the way. I still prefer to wrap the excess Kevlar lace around the lacing closest to my toes which keeps them out of the way. While Salomon did not change a whole lot in the EVA midsole of the Speedcross 3, it did lower the heel drop from 12mm to 9mm. Stack height remains basically the same (only the heel was lowered), but the lowered heel drop was definitely noticed and seemed to add stability and sure-footedness on technical trails and descents. Salomon got rid of the dual-density foam (pronation insert) on the medial side of the Speedcross 2 which qualified the Speedcross 2 as more of a lightweight stability shoe. Instead, injected EVA foam runs the length of the shoe and provides more than ample cushioning and protection. To be honest, I didn’t notice the Speedcross 3 lacking in stability when compared side-by-side with the Speedcross 2 due to the lower drop. Also, getting rid of the stability features seems to make the Speedcross 3 a bit more flexible through the foot strike. Also noticeably absent in the design is a rock plate. Salomon stuck with what worked for the Speedcross 2 and the generous cushioning in the Speedcross 3 gave my feet more than enough protection on rocky terrain. An already simple and effective outsole design was slightly improved for the Speedcross 3. 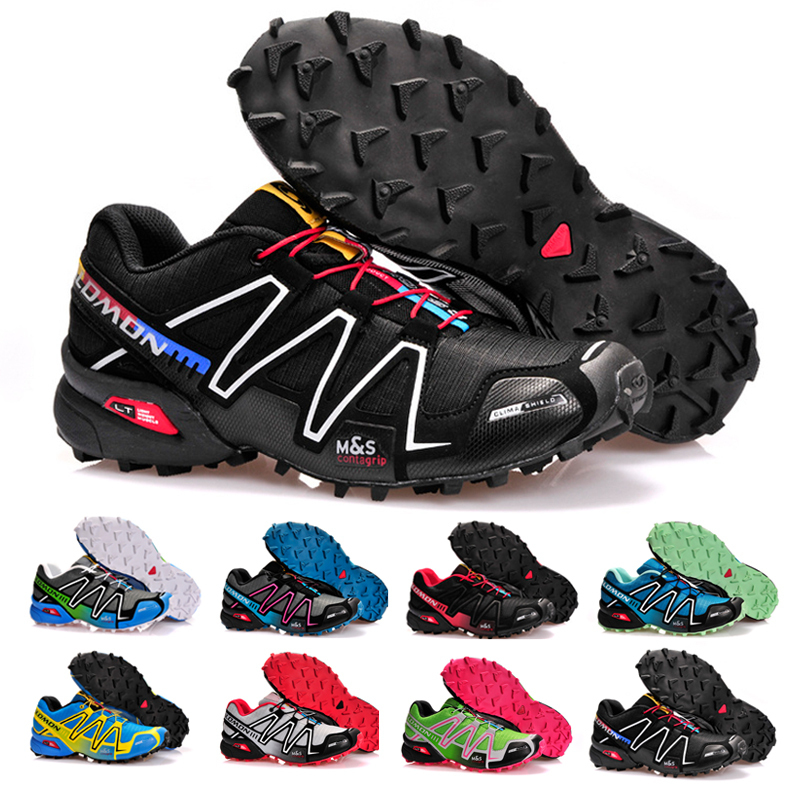 Salomon updated its Mud and Snow Contragrip design using the same chevron lug pattern, pointing forward on the forefoot and toe and pointing backward on the heel area, but used slightly larger lugs with a bit more spacing between them. I found that the spacing helped the Speedcross 3 shed mud and clay quite well. Also added are little rubber nubs that poke out of each chevron lug like a small rubber spike. They are small enough not to notice while running on the roads, but I do think that they helped a bit on wet ground and packed snow/ice, although this could just be the placebo effect at work? These little nubs are tough as well, as they show no wear after well over 100 miles of mixed trail and road running. The weight of the Speedcross 3 stays basically the same as its predecessor (11.2 oz on the mail scale for men’s 9.5). This puts it a little outside the weight class of “racing shoe” in my opinion. I think we’ve seen a shift in the market toward an attempt at getting many trail shoes below 10 ounces. I tend to gravitate toward this shoe for short, technical, faster runs or runs with a lot of technical vert where I will value the extra grip. The improvements in the Speedcross 3 are great, especially the slightly lower drop and wider toe box. Folks that liked the Speedcross 2 will like the improvements as I did, and my Speedcross 2′s have to be a testament to the durability of these shoes. (Mine have over 1,000 miles on them and they are currently my “screw shoes” for icy trails). However, from the durable comes hot feet. I was reminded of this recently when I wore some very thin Merino wool socks with the Speedcross 3′s on a 65-degree day. A week later, I was thankful for the thick weave of the upper while post-holing through snow. One thing is for sure, Salomon has continued to improve this proven technical trail shoe which will not disappoint.